Tower Gardens are a great way to take food education into the classroom. McPolin third grade Spanish teacher, Todd Hansen, is 3rd Grade Teacher, Todd Hansen, with Salsa Tower Gardengrowing a salsa garden in his class room. During an upcoming math lesson, the students will harvest the tomatoes, cilantro and peppers and use a recipe with fractions to prepare salsa. Now that’s yummy learning! We’re looking to expand the Tower Garden program to all schools in the district. If you would like to help fund a Tower Garden, contact EATS or click here to donate. 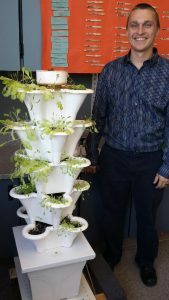 A Tower Garden costs about $1,000.